His merchandise well received by American Superstar as big as "Forbes Riley"
His merchandise featured in an American movie, "Joyce"
Received shout-out from WWE Superstars as big as "Kurt Angle" & "Booker T"
"Mian Mohsin Zia deserves a standing ovation." -- Michael John Wolfe, Hollywood Actor, USA. "Mian Mohsin Zia is the brightest light on Pakistan's new literary horizon." -- Burl Barer, Edgar Award winner and New York Times Best-Selling Author, USA. "Mian Mohsin Zia is an outstanding author, speaker, and personality. He is also a marketing genius. This winning combination keeps me wanting to read more, hear more, and discover more both about and from him." -- Cassandra Seidenfeld, American Actress, Producer and Philanthropist. “Mian Mohsin Zia is a bright star, a talented award winning author and also passionate about what he's doing helping people market their work and becoming successful. Keep an eye on Mian as he wows us even more with his new projects and his strong voice.” -- Dr. Jo Anne White, TV and Radio Show Host & Executive Producer, USA. "Mian Mohsin Zia is the best when it comes to writing and marketing." -- Robynn Lin Fredericks, American Actress and Producer. 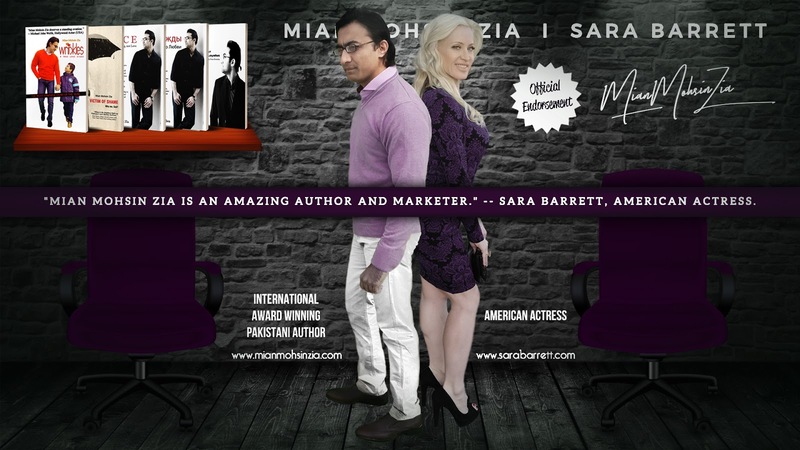 “Mian Mohsin Zia is one of my favorite authors and he is a genius when it comes to marketing.” -- Samantha Heer, American Actress. 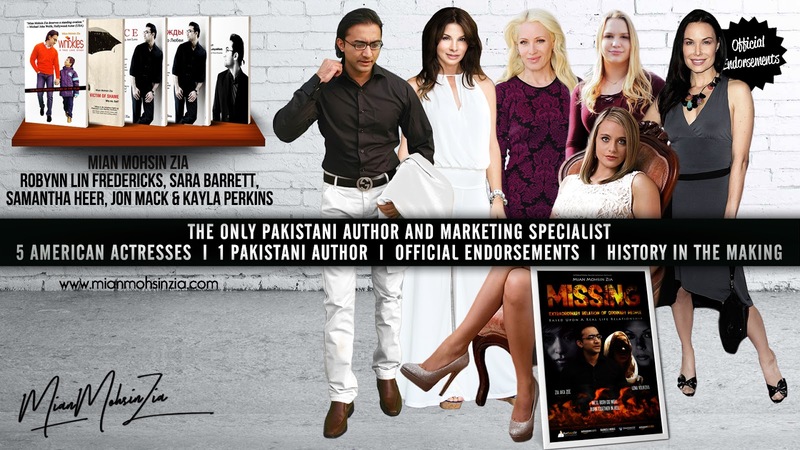 “Mian Mohsin Zia is a very talented and creative writer.” -- Tracey Ferrara, British Actress. "Mian Mohsin Zia is a genuinely great writer for the 21st Century." -- Caroline Oakes, British Film, TV and Theatre Actress. "I always look forward to reading Mian Mohsin Zia's highly prolific work." -- Howard Lapides, TV and Motion Picture Producer, USA. 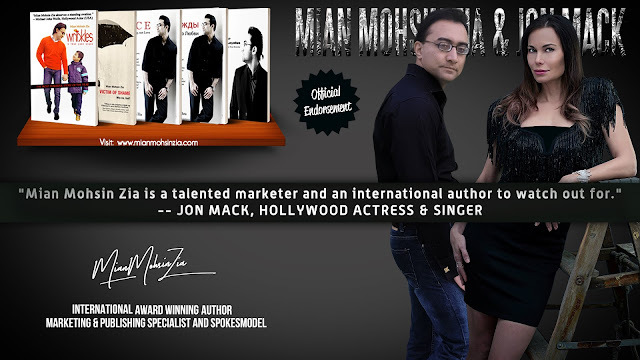 "Mian Mohsin Zia is an amazing author and marketer." -- Sara Barrett, American Actress. “Mian is simply the best. His marketing expertise and writing are of the highest quality. 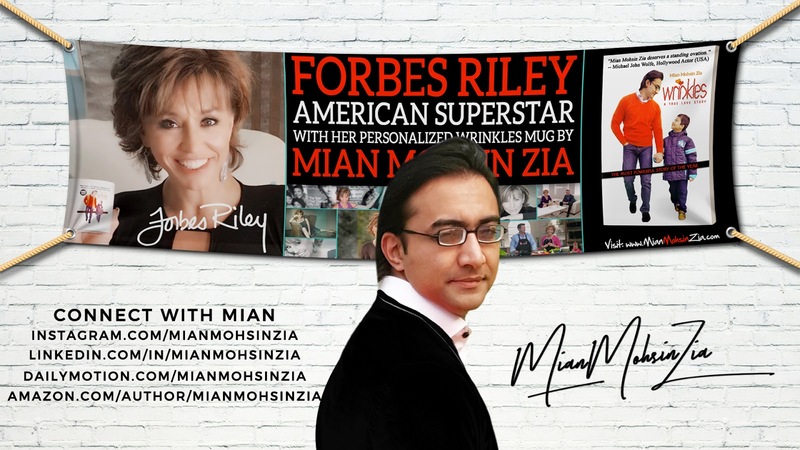 Mian is one of a kind and I highly recommend connecting with him and learning the skills to master marketing, publishing, and writing.” -- Catherine Valentine Parish, American Actress and Model. “Mian Mohsin Zia is an excellent author. He is professional and easy to work with and well spoken. Mian is skilled in many areas and is a wonderful addition to any professional setting and / or person.” -- Mark Edward Howell, American Actor. 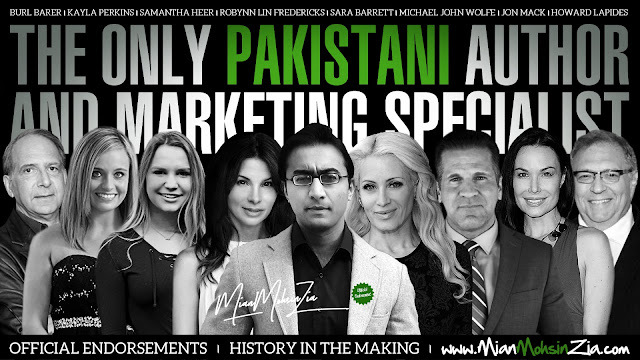 "Mian Mohsin Zia is such an amazing author and a great marketer in this business. Be sure to check out his work." -- Kayla Perkins, American Actress & Model. "Mian Mohsin Zia is a talented marketer and an international author to watch out for." -- Jon Mack, Hollywood Actress & Singer. Mian Mohsin Zia, aka "M I A N-----No Time for Love", was born October 22nd in Lahore, Pakistan. He matriculated in 2001 from Beacon House School, completed his intermediate schooling in 2003 from FC College (Forman Christian College) and graduated in 2005, from the same institute under the Punjab University. After that he moved on to Punjab University, the most prestigious educational institute in Pakistan, for his post graduation. He was admitted to the Institute of Administrative Sciences, Punjab University, for his master’s in marketing. He was the Scholarship holder of Punjab University. After successfully completing his master’s, he trained and worked as an Online English Language Teacher. He trained many students from different parts of the world; Russia, Germany, South America, Ukraine and Japan etc, to speak English fluently. Meanwhile, he worked on writing his first novel: "The Strange Loyalist-----Inspired by True Events." He was determined to get his first novel, "The Strange Loyalist-----Inspired by True Events", published. It has been read by people from different parts of the world, such as Germany, South Africa, Oman, Russia and Ukraine. He received a monumental response internationally for his novel. He loves writing and that is his passion. He is also a heavy weight trainer and has mentored many people. Exercising at the gym is one of his favorite hobbies. He pursues a career as an English Author and continues to write more books. “MISSING: Extraordinary Relation of Ordinary People" is his fifth book that he is working on nowadays. His books have been read and reviewed by Hollywood actors and actors from British film industry. Moreover, his books have been read and reviewed by Edgar Award winner, and New York Times best-selling author; Burl Barer, as well as many other US authors, professional book-reviewers, and professionals from other fields of life from the USA, Canada, Australia and New Zealand. His merchandise has been well received by American Superstar as big as Forbes Riley and other actors from US and UK film industry including Cassandra Seidenfeld, Michael John Wolfe, Samantha Heer, Kimi Acosta, Robynn Lin Fredericks, Caroline Oakes, Kayla Perkins, Jennifer Scott, Catherine Valentine, Hollin Haley, Nicole Butler, etc. He has received international recommendations for his work and various professionals from America have labelled him as "King of Marketing." His book “ONCE: Ask Me Anything, Not Love”, already recommended to be a movie, is the finalist in the “Readers’ Favorite International Book Award Contest 2013” held in the USA. According to Readers Favorite; MIAN is one of the first Pakistani authors to be recognized in the contest. Most categories in the contest received over 100 entrants and the contest featured thousands of authors from nearly a dozen countries. "ONCE: Ask Me Anything, Not Love" has also been translated into Russian. Its Russian title is: "Однажды". His third book, “Victim of Shame: Why me, God?”, also received a positive response from authors, professional reviewers, and readers world-wide. His fourth book "Wrinkles: A True Love Story" won bronze medal in the "Readers' Favorite International Book Award Contest 2016" held in the USA. This is the same award contest that Hollywood actor, Jim Carey won for his book in 2014. This makes MIAN an international award winning author. One of the trademarks of his books is that he always tries to illustrate the protagonist on the cover page instead of just coming up with a random picture. His books always focus on entertainment, but, at the same time, they have a deep lesson to teach the readers. He writes meaningful fiction, books that enlighten. He always tries to unmask and unveil the frailties hidden in society, and in a very gentle way, he conveys a very deep message to the readers. Farah Hussain, leading television anchor, interviewed MIAN live on her morning show: "A Morning with Farah - ATV". American actress, Samantha Heer interviewed MIAN live on her show “Slate Me”. PhD Doctorate, Jo Anne White from USA interviewed MIAN live on her show "Power Your Life". Paula Vail interviewed MIAN on her show "Choices" on WBTVN. Melissa Clark interviewed MIAN on her show "The She Shift". Voice America Host, Tony Durso interviewed MIAN on his show "Revenue Chat". 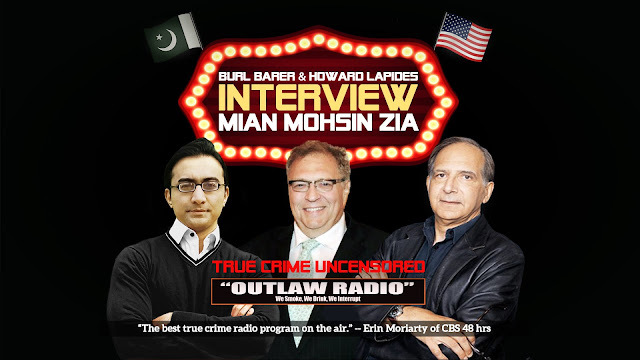 Burl Barer and Howard Lapides interviewed MIAN live on American Radio Show; True Crime Uncensored on OutLaw Radio. Sundus Khan interviewed MIAN live on her show, "Mehekti Morning" on ATV. Kamaria T. Richmond interviewed MIAN live on "The Stroke Diva Fabulous Radio Show". MIAN received shout-out from WWE Superstars as big as Kurt Angle, Booker T, Allie and Chelsea Green. 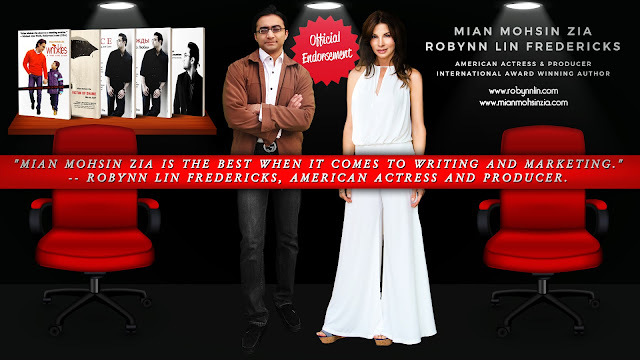 Being an international award winning author, MIAN is also a speaker, spokesmodel, publishing and marketing specialist. Therefore, he looks forward to speaking engagements, spokesperson opportunities, helping other writers and encouraging them in their self-publication efforts as well as companies in their marketing and branding endeavors. Amazon registered, recognized and approved MIAN as a brand and allotted him an official Amazon Brand Store featuring his author brand, apparel brand and mobile accessories brand. MIAN is also a contributor at Getty Images and iStock Photos featured as a model. He also represented Pakistan Online in a "German University". MIAN bags another milestone under his belt. He was invited by the University of Central Punjab (UCP) to be the "Guest of Honour" and "Jury Member" and lecture the university students on marketing, as well as judging their business models. MIAN delivered a successful and inspirational lecture and graced the occasion with his charismatic personality. At such a young age, when people are studying at University, MIAN achieved another milestone as he lectured students of his age group and shared his wisdom with them. COMSATS University invited MIAN as a "Guest Speaker" to lecture the students on marketing. MIAN delivered an inspiring lecture at COMSATS and distributed his signed merchandise among students. 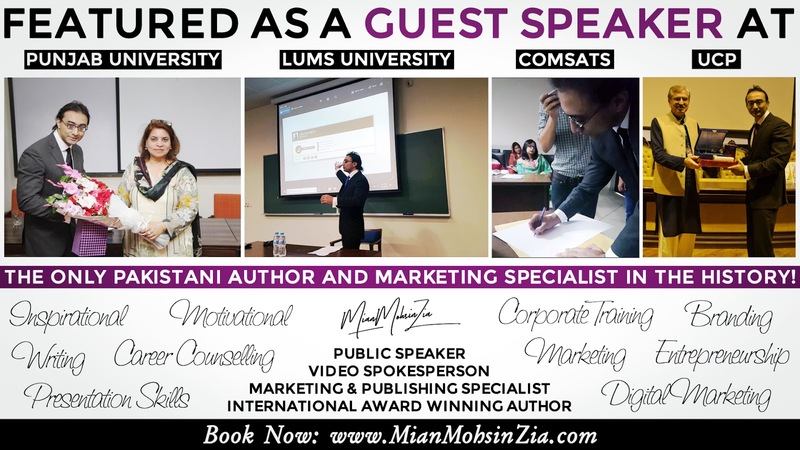 LUMS University invited MIAN as a "Guest Speaker" to lecture the students on "Personal Branding and Employability Skills". MIAN delivered a successful lecture and counselled students at LUMS. Forman Christian College (FC College) - A Chartered University invited MIAN as a "Guest Speaker" to lecture the students on "Marketing and Branding". MIAN delivered a successful lecture. This is a huge achievement for MIAN as he was once a student at Forman Christian College and now a guest. At last but by no means the least. Institute of Administrative Sciences (IAS), University of the Punjab invited MIAN as a guest speaker and panelist where MIAN lectured the students on Digital Marketing and served as a panelist for a brainstorming session. MIAN paid a special tribute to his teachers at the event in his own style which was highly appreciated by the audience. Respected Ma'am Nasira (Dean) presented MIAN with a souvenir at the end of the event. This is a huge achievement for MIAN as he was once a student at the IAS and now a guest. He believes in one thing: "I am nothing. All praises go to Almighty Allah, along with my eternal inspiration the Prophet Mohammad (Peace be Upon Him) as always."